Ground cherries. I had absolutely no idea what they were until I saw them at a farmers market here in Boston. When I walked by them I said, “Aww, baby tomatillos!” The sign said “ground cherries” so I asked the woman more about them. She carefully unwrapped one from it’s papery husk and handed it to me. Wow, so weird. And so good. They’re the size of cherry tomatoes. The ripe ones are a pale golden yellow. They have a hint (just a hint) of tomato, but are much sweeter. They smell like fresh strawberries, have the sweetness of grapes, and have a vaguely pineapple flavor. And a little vanilla, too. Weird. But good. I picked up two little cartons and then let them sit on my counter for four days. I couldn’t figure out what to do with them, and I thought the point would be moot since they were probably spoiled. But nope! They store extremely well in the fridge, and as it turns out, pretty well on your counter top, too. The most traditional way to use them is in pie. 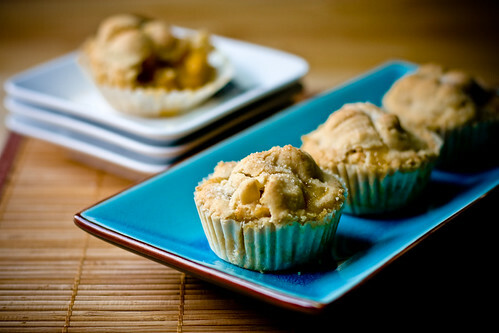 I been thinking about a way to make miniature pies in cupcake tins, so here was my chance to try it out. The upshot is that you can use the technique with whatever fruit you can find, should ground cherries not be available. Begin by making the pie dough. For a step-by-step, see this recipe. Line a cupcake tin with cupcake papers. Spray lightly with oil. Place a scant tablespoon of dough into the bottom of each cup. 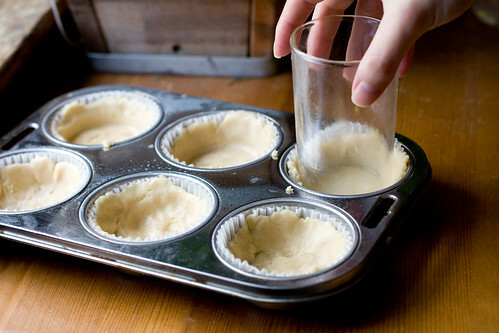 Using a small glass dipped in water (one that has the same diameter of the bottom of the cupcake cup), press the dough to form a bottom crust. Take small pieces of dough and build up the sides of the cup with dough, making sure the walls aren’t too thick. At this point, you can use the glass again, dipped in water so it won’t stick, to neaten everything up if you want. Your finished pie shells should look something like this. Place the shells in the refrigerator for a few minutes to firm up. 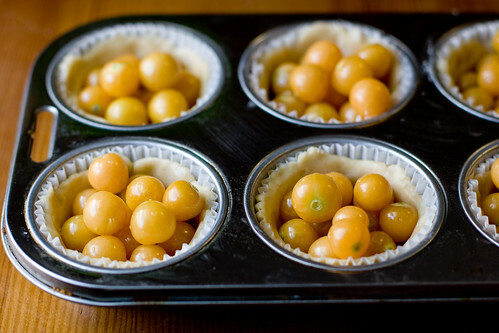 Preheat the oven to 400º F. Remove the shells from the fridge and fill to the top, slightly overflowing, with ground cherries (or whatever fruit you’re using). Add 1/2 to 1 tsp of the sugar/flour mixture to each cup, depending on how sweet you want your pies. 1/2 tsp was sweet enough for me, allowing the flavor of the fruit to show through. If you’re using something tangier or less sweet, you’ll want more sugar. Cover the back of a cookie sheet with a sheet of plastic wrap. Add the rest of the pie dough, and cover with a second sheet. 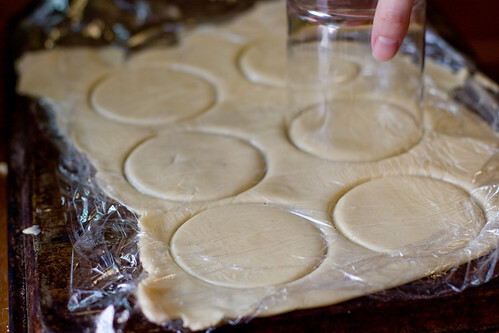 Using a rolling pin, roll out the dough to 1/4-1/8″ thick. 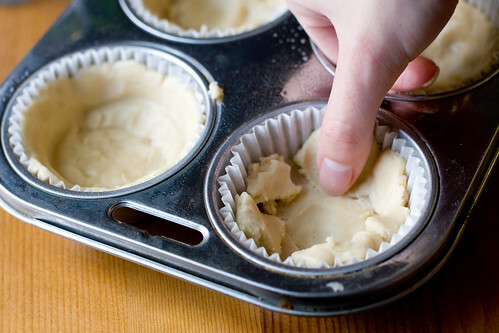 Using a glass that has a slightly larger diameter than the openings of the cupcake cups, stamp out six pie crust tops. Place this in the freezer for a few minutes, or into the refrigerator for 10-15 minutes. Once chilled, you should be able to easily peel out the tops and place them over your pies. Pinch the edges down, slash a X in the top with a sharp knife, and sprinkle with sugar. You can do other types of tops, such as lattice work, if desired. Bake for 30 – 35 minutes, until golden brown. 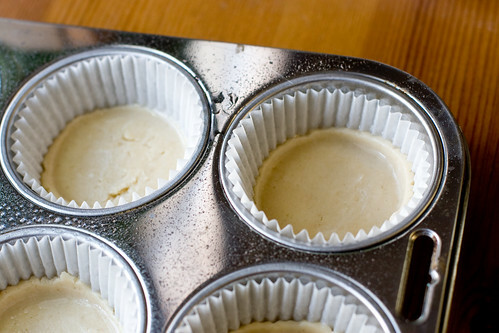 Let cool for several minutes before gently removing them from the cupcake tin to cook completely. Again, you can use any fruit you like, but if you ever see ground cherries, definitely try them. 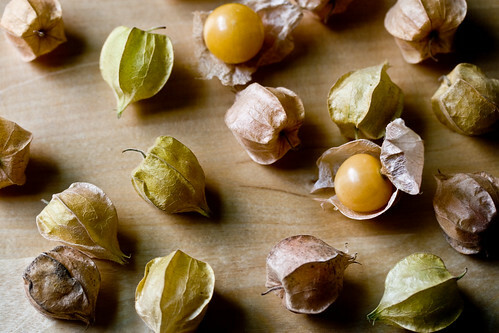 They’re also sometimes called cape gooseberries (though some people say it’s a different fruit in the same family), husk tomatoes (which usually refer to tomatillos…), goldenberries, and a host of other names. Whatever they’re called, they should be small, sweet, and surprising. Make a jam, dip them in chocolate, add them to salsa, or eat them raw. Okay! Seems like a lot of people find these growing nearby their homes. PLEASE don’t eat them unless you’re SURE they are okay to eat. Wikipedia lists over 35 different plants in the Physalis genus. That’s a lot! So there’s no guarantee the species that is growing near you is this same species I’ve written about. Please be careful!! Even if they are safe to eat, they might not taste the same. If the people that live around you don’t tend to eat the fruits of the bushes you see, there might be a very good reason why. Wild foraging can be dangerous, so please eat only ground cherries that you find at markets that have a reputation for, well, selling non-poisonous food. Ha! September 9, 2008 - 7:47 am A.S.
Great pics. I made them two days ago w/blueberries & strawberries. Yours look waaaaaaaay better than mine did, but looks aside, mine tasted great. I think that I used too much dough on the bottom of the cupcake liner – I had to make more dough to cover the tops! And, I also must have put too much fruit, because the blueberries leaked everywhere. But, they were awesome in taste – I just need to make more to practice! Thanks for a great vegan recipe and lovely pics. That is interesting! They really do look like tiny tomatillos! Can’t wait to try out the recipe! My god you’re genious! Vegan recipes, amazing pictures.. I’m going to try some this weekend. Thanks. this was much better with raspberries in it. the sugar helps the ground cherries, but ground cherries indefinitely do not work as well as the former. I just made these with blueberries and also ran out of dough by the time i got to the top… So I cut up what I had left with cookie cutters. I just found these at our Farmer’s Market as well. They are so interesting. Pineappley. Crazy! Great use of them. i don’t bake very often because i don’t have sweet tooth but when i saw the photos of the cupcake pies i tried out your recipe. actually, i really like the idea and the fruit inside turned out very well. 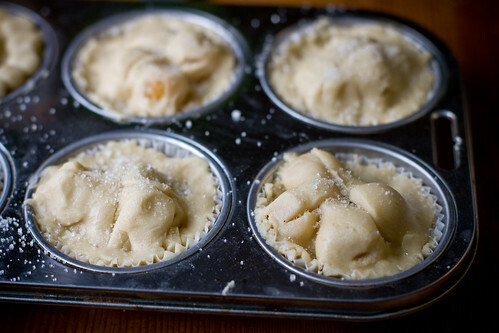 but the dough was too brittle and broke as soon as you tried to take the pies out of their moulds. so what was on the plate was a heap of crumbles and fruit mash… is there a vegan egg substitute that does the binding job? do you have any experience with that? some people suggested bananas instead of eggs but i don’t want the dough to taste of bananas. any suggestion would be very welcome!! I picked up a Ground Cherry Tomato plant at Russell’s Garden Center on Route 20 in Wayland MA. Another shopper persuaded me to grow it and I am really glad she did. They are the perfect outdoor fruit to bring to BBQ’s. Leave lots of room for it to spread. One plant grew to be approx. 8 feet long and 3 feet wide. These are called Nances in Mexico. I never knew that people eat them in the US. I will have t olook for them around here. I’ve been obsessed with these ever since I saw this post. Ground cherries were at a couple of stands at my farmers market labeled as “pineapple tomatillos” I’m making them tonight and very excited. Great cupcake pie technique photos! I have been looking but haven’t foudn ground cherries yet. I’m going to have to grow my own next year to get them. http://www.tradewindsfruit.com . Free shipping on an order over $7.50. I’ll have to check our Farmers Market now. Keep up the great work. 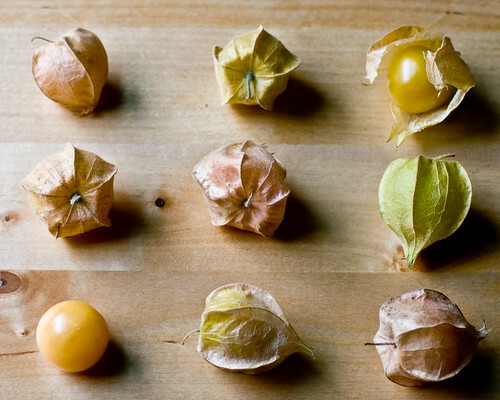 I have ate ground cherries for about 50 years, I love them. I purchase ground cherry preserves when I can find them. Thanks for this post! I used to eat these all the time when I was an exchange student in Denmark, where they’re called ananaskirsebær, or “pineapple cherries,” but I didn’t know what they were called in English. And the pies look great! tried your recipe over the weekend and loved it. will post soon with results. I was cruising around your site this morning and saw these, then when I got to the store for groceries, there they were, waiting for me! 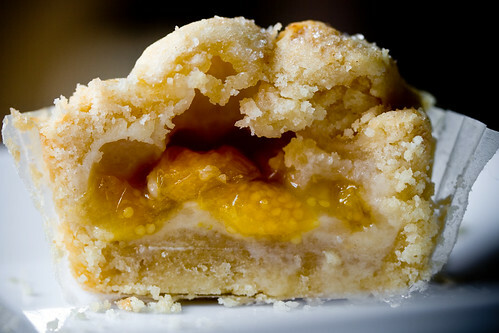 These are absolutely lovely, have them baking in a little hand pie now! Thanks! i’m growing ground cherries this year in my garden because of this post! I discovered these a couple of years ago on a trip to Montreal. I’ve been going nuts trying to find a local source for them. Clearly by the time I get to the Copley Place farmer’s market, they’re all gone! I just ordered some seeds and I’m going to try to grow them in my Aerogarden. They’re supposed to grow pretty much like cherry tomatoes. Since they only grow up to 1 to 3 feet tall, they should be perfect. I love ground cherries. We grow them every year. They come up automatically every year because what when the fruit is somewhat eaten by ants and you don’t get all the cherries off the ground in the fall the plant comes up in the spring by themselves.. It’s great to see them every year. My mother makes double crust pie, custard pie and jam out of them. At one time I found receipes for coffee cake but now I can’t find anything like that. I would appreciate any other ideas from people. 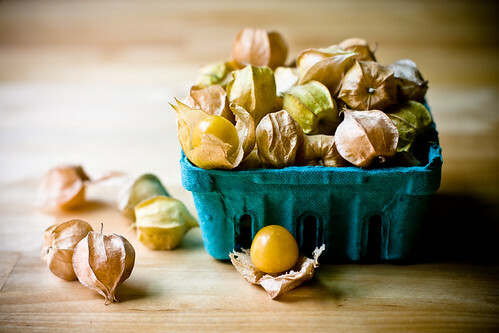 Hi, we are growers of ground cherries in Ontario, Canada (just north of Toronto)…for people in Southern Ontario/Greater Toronto Area, you can order ground cherries from us by our farm email, which is [email protected]. We have over 350 plants growing of these beautiful, versatile little beauties…..great in pies, preserves or just eating out of hand. ANYway: I have introduced friends to ground cherries over the years as wonderful little fruits that pick themselves when ripe, have no pest or disease problems in the garden (and grow ever so much larger & tastier there when cultivated and coddled by good soil & regular watering). It has been difficult to resist eating them just as they fall, but some years I have had enough garden space for more than a couple of plants (they are low-growing but definitely do like to sprawl, elbowing less energetic plants aside as they go!). Then I have made pies and also tried jam–thanks to a recipe in one of edible wild plant guru Euell Gibbons’ books–but found it much too sweet for my taste, even after fiddling with it and adding lime juice. May play with the recipe again this year as so far it looks as though I will have a very generous harvest of the little lovelies. If anyone has a jam recipe for these, please post it!! Oh–and Pinetree Seeds is one U.S. source for the seed; I think Nichols Garden Nursery also has them. Once grown, they will self-sow or a gardener can save the seed just as one would tomato seeds; propagation & culture also is the same. Maybe next year I’ll grow extras & take them to market here in central Ohio. P.S.– Vegan yumyum–your photos are mouth-wateringly wonderful and inspiring! Wow-wowee-wow! I am SO impressed by your great cooking skills, this fantastic idea, and your photography. Gorgeous!!! I’ve been wondering if I could make pies or crisps in little cupcake tins because I do much better when baked goods come in portions. (that way, I don’t eat the whole thing in one sitting… ;) ). Love this idea, and as I have a carton of lovely groundcherries from my CSA sitting on my counter, I’ll be making some of these very soon! Thank you so much!!! I made these and they were AMAZING! I was so excited to see ground cherries at my local farmer’s market and knew straight away that i had to make these. Delish! I also just discovered them at my local farmers market & used them in a fresh corn salad. They inspired me to invent a hispanic style dish: Fresh corn off the cobb, finely diced serrano, green onion, tomatoes, ground cherry, lime juice & cilantro. It was definitely yuuuuuuuuuuum!! Thanks, these look lovely and yummy. 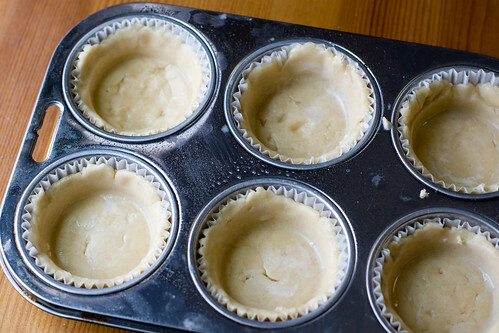 I never made cupcake pies before, so this might sound like a stupid question, but what do you mean with “removing them from the cupcake tin to cook completely.” Does that mean that when the 30-35 minutes are over, I remove them, and then put them back into the oven again without the tin? For how long? Thanks for enlightening me!